Providence, RI — Craftland kicks off its 11th annual Holiday Show on Friday, November 23, 2012 with thousands of gifts for everyone on your list. Craftland, located at 235 Westminster Street, is the city’s premiere destination for handmade goods by independent artists—from one-of-a-kind craft items to fine art pieces. Half of the 170 artists featured in this year’s show are local to the area. Shoppers can feel satisfied that their gift-buying dollars are not only supporting a local business, they also sustain the region’s creative talent, keeping our economy both strong and vibrant. Craftland shoppers will find an expanded store filled-to-the-brim with thousands of thoughtfully made items from handmade housewares and masterfully-crafted handbags, to adorable stuffed animals, cozy crocheted and knitted goods, one-of-a-kind art pieces, beautiful books, clothing, and our now-famous print wall, featuring dozens of screen printed pieces in a variety of prices and sizes. With prices from $1 to $300, there are handmade goodies for every budget. As always, purchases from Craftland are tax-free, and parking is easier than you think. Park at the Grant’s Block parking lot for two hours free with a validation stamp from Craftland. More parking information can be found on the In Downcity website. Craftland Show 2012 runs from November 23 – December 31, 2012 and will be open seven days a week 10am – 6pm – and open late Thursdays – Saturdays 10am – 8pm. Craftland Show Super Celebration Bash: Party! Friday, November 30th, 5-9pm. The first 100 shoppers receive highly-coveted goodie bags stuffed with freebies, coupons and more. Plus delicious Trinity Beer, snacks from Julian’s, music and fun activities. RSVP on Facebook here. BUY ART Reception: Meet the Buy Art artists; Thursday, December 6th, 5-8pm. See the original works available on this year’s Buy Art pins. Meet the Artists Evening: Demos and refreshments; Thursday, December 13th, 5-8pm. Come visit with the Washington DC ladies of Hello Craft and the authors of Handmade to Sell! We’ll talk the business of craft, and make pinback buttons in this casual author meet and greet. Whether you’re new to crafty biz or an old pro, Kelly and Christine will tackle your most pressing business related question. Copies of Handmade to Sell will be available for looking and for sale. Premium printers MOO will also be on hand to show off their amazing services for independent artists. Late-Night Madness: Open till 10pm; Friday, December 21st, 10am-10pm. We know it’s hard not to procrastinate the inevitable sometimes. And we’re here for you. 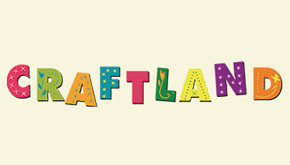 But unlike the holidays, Craftland doesn’t end in December. Fun and quirky handmade gifts can be found year-round at the Craftland Shop, also located at 235 Westminster Street. For more information, please call 401.272.4285 or email info@craftlandshow.com.